One of the oldest and most basic pieces of equipment found aboard any boat is the anchor. Some of the earliest anchors discovered by archeologists date back over 2,500 years to the Sea of Galilee, and they were little more than circular, heavy stones with holes drilled through them to attach a rope. A simple yet effective invention, motivated perhaps by the rumor that seamen of old hated the job of pulling the anchor almost as much as boaters do today. For this reason, an enterprising mariner invented the earliest windlass, which consisted of a wooden wheel with a lever attached so the anchor could be wound to the surface instead of pulled up by hand. Pulling an anchor off the bottom hand-over-hand in the best of conditions is a lot of work. Add the pressure of moving water or heavy currents, like when anchored in a river or near an inlet, and your work is compounded. If you anchor in deep water, the amount of rode can easily become hundreds of feet, making it more work still. Properly rigged ground tackle “that’s boater’s jargon for a properly assembled anchor system” not only has a heavy anchor to contend with, but also a significant length of chain, which helps the anchor establish a good bite on the bottom and maintain the proper angle between the anchor and the boat so it maintains its grip. If you were to do a survey of recreational boats today, you would find that most do not have an electric windlass so we are still in the era of pulling anchors by hand…or are we? 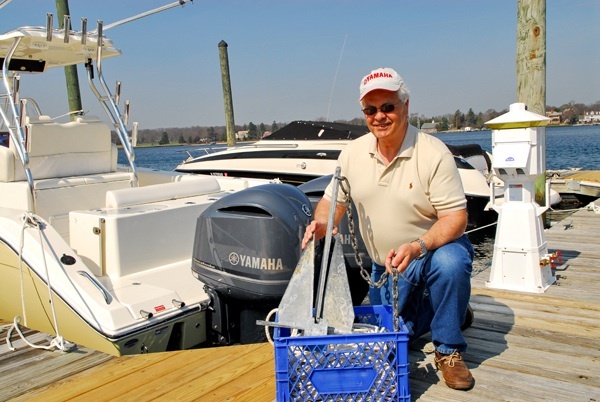 There is a simple method of raising your anchor off the bottom that uses the power of your boat’s engine to accomplish the task. Better yet, it is inexpensive, easy to use, works under any conditions and can retrieve an anchor no matter how deep the water, how strong the current or how long the rode. 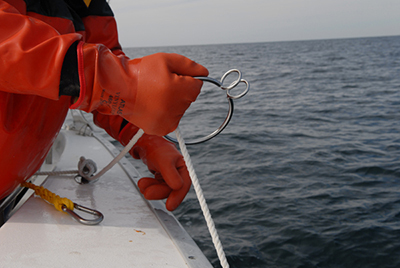 Say hello to the Anchor Retrieval System (ARS). It is extremely popular among saltwater anglers who use one or two sets of ground tackle when bottom fishing and anglers who bottom fish on inland rivers. But the system is growing in popularity among the general boating public, too. 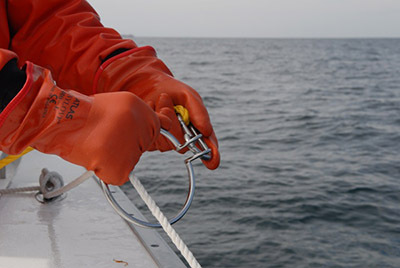 An ARS consists of four components: a vinyl tuff-end buoy that has a large line-hole attachment point; a short length of line; a stainless steel spring clip and a device called, appropriately enough, an anchor ring. 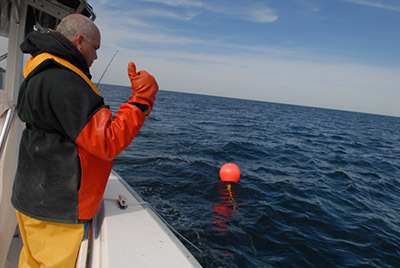 The size of the buoy corresponds to the weight of the anchor and chain, since it must offer enough buoyancy to float the weight to the surface. When you use the components together, one end of the line is attached to the line hole of the buoy and the other end attaches to the spring clip. These connection points are usually accomplished by splicing the braided line, but you can buy the system pre-assembled so there are no worries about having to learn rope craft. The following pictures were shot aboard the Duct Work, a Yamaha-powered 31-foot Cape Horn® center console during a bottom fishing trip with Capt. Phil Leo (www.ductworkfishing.com). The ARS was used numerous times during the day to effortlessly retrieve a large Danforth® anchor and long length of chain from as deep as 130 feet down. You can pick up an ARS at most marine stores or online for about the cost of an anchor. If you use your anchor with any regularity, it will be the best money you’ll spend on boating all year. As part of an ongoing instructional series, Yamaha Outboards produces articles related to boating and fishing using its Pro Team as sources. For more information on Yamaha, visit www.yamaha-motor.com/outboard﻿.